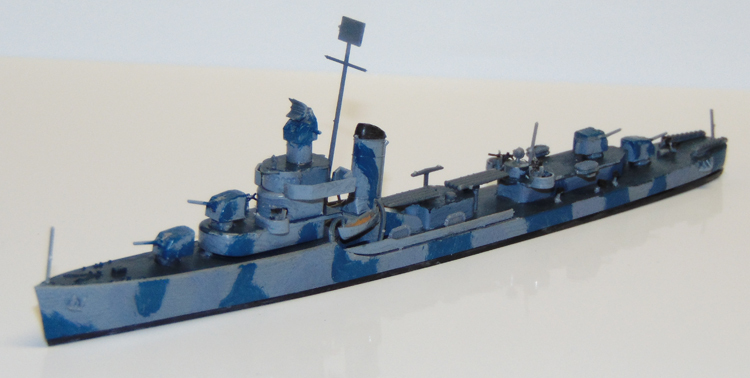 Shown below is a 1/700 Scale Sims Class destroyer hand painted by Michael Megee of the Craig Hewitt IPMS chapter in Phoenix, AZ using Tru-Color paint exclusively. It demonstrates that Tru-Color paint can be hand brushed onto models with ease. The camouflage pattern was random as the model is too small for masking, but the hand brushing technique shows that multiple colors can be applied successfully without smearing the layers. So that the military modeler can see what colors we have in our product lines, we have attached our current flyer that you may print out for review. If you have any questions, please do not hesitate to ask.